Stuffed pasta or stuffed dough recipes are a staple around the world. From gyozas and steamed dumplings in Asian countries to empanadas in Latin America and ravioli in Italy, these doughy pillows are convenient, inexpensive, easy to use, and fast to cook. Zero in on the stuffed pasta of Italy and you will find a wide variety of tortellini, ravioli, and cannelloni. If you want to shave some time off of the recipes that call for making the pasta from scratch, you can make these recipes with any flavor of pre-made tortellini or ravioli. Just cook the pasta until it is hot and tender, then proceed with the recipe. It is usually the sauce of the recipe that gives it that unique spin and deep homemade taste. Or, take a look at a recipe for a different take on a traditionally Polish dumpling—pierogi—that is transformed into a classic American mac and cheese. Check out this collection of stuffed pasta hot entrees and some chilled salads. All of them are delicious all year round. If you want a make-ahead casserole perfect for entertaining, this is it. This recipe uses pasta sauce, Alfredo sauce, and pesto to make a decadent and delicious dish. Make it ahead of time by assembling it, then cover and chill in the refrigerator until you are ready to pop it into the oven. Since it is chilled, add another 10 to 15 minutes to the original recipe of baking time, until it is hot, bubbly, and perfectly wonderful. If the major daunting thing about cooking for you is the time you spend in the kitchen, then this recipe should make you happy. 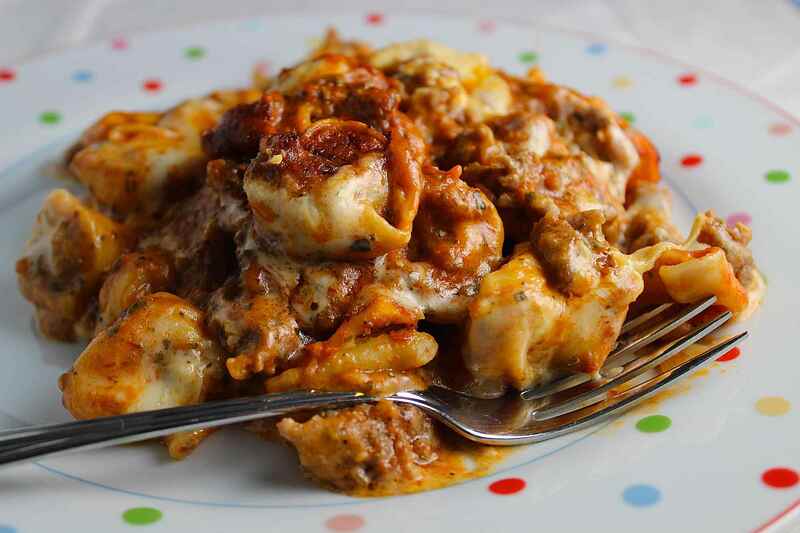 Combine frozen tortellini and sauces in a casserole dish and toss it in the oven. Go do a crossword or watch an hour-long drama, and much to your surprise, the oven did all the work for you. You will be amazed at how easy it was to make. This dish only needs five minutes of prep time. Truly, the best part is how wonderful it tastes. So if you knew you could make fresh ravioli—absolutely from scratch—and it would not be very difficult, would you do it? Making the dough takes a little time, but, if you have a pasta machine, flour, eggs, and salt, you can make a fresh dough and three-cheese ravioli in less than an hour. In Italy, the long tube-shaped pasta called cannelloni that is usually filled with ricotta cheese is known as "manicotti" in the United States. To make this recipe, you can use sheets of fresh pasta or dried cannelloni tube pasta, which should be cooked according to the package directions so as to not overcook. Both give great results. Tortellini are a type of ring-shaped pasta that is typically stuffed with meat or cheese. They are popular in broths or topped with sauce, but they are also delicious served cold as part of a salad. Tortellini can be purchased freshly assembled in the deli aisle or frozen. The frozen variety may keep longer, but a package of fresh tortellini cook the quickest. Either one can be used to make a hearty sausage tortellini soup that will warm your soul.